Where can I find the USMT return codes and error messages for USMT 5 based migrations ? | just another windows noob ? ← How can I manually add WinPE 5 boot images to System Center 2012 Configuration Manager SP1 CU3 ? Where can I find the USMT return codes and error messages for USMT 5 based migrations ? If you are using System Center 2012 Configuration Manager SP1 to migrate your computers from Windows XP to Windows 7 (or Windows 8) then you’ll be using USMT 5 (from the Windows 8 ADK). The return codes and error messages for this version of USMT have been updated since the release of USMT 4 and it’s good to know where they are and what they are. Today while testing Offline (hardlinking in WinPE) migrations from Windows 7 to Windows 7 I encountered a USMT return code 3 and I wasn’t familiar with the return code. I had to find the USMT return codes for USMT 5 in order to understand the reason it was happening and how to resolve it. When running loadstate I was using a wrapper to ‘catch’ error codes and process them, but I wasn’t catching Return Code 3 as I wasn’t aware of that return code (it didn’t exist in USMT 4 and is not listed in the USMT 4 return codes either). Here are the definitive list of USMT 5 return codes, based on the table provided I could see that USMT return code 3 = USMT_WOULD_HAVE_FAILED which meant that I had to review the loadstate.log file to see what additional information was processed. 3 USMT_WOULD_HAVE_FAILED At least one error was skipped as a result of /c Review ScanState, LoadState, or UsmtUtils log for details about command-line errors. After reviewing the loadstate.log I determined that the errors were superficial and safe to ignore. By allowing for USMT return code 3 (based on the info in loadstate.log) in my loadstate error catcher script I was able to complete USMT successfully. The entire USMT return codes for USMT 5 are listed below for your reference. 11 USMT_INVALID_PARAMETERS /all conflicts with /ui, /ue or /uel Review ScanState log or LoadState log for details about command-line errors. /auto expects an optional parameter for the script folder Review ScanState log or LoadState log for details about command-line errors. /encrypt can’t be used with /nocompress Review ScanState log or LoadState log for details about command-line errors. /encrypt requires /key or /keyfile Review ScanState log or LoadState log for details about command-line errors. /genconfig can’t be used with most other options Review ScanState log or LoadState log for details about command-line errors. /genmigxml can’t be used with most other options Review ScanState log or LoadState log for details about command-line errors. /hardlink requires /nocompress Review ScanState log or LoadState log for details about command-line errors. /key and /keyfile both specified Review ScanState log or LoadState log for details about command-line errors. /key or /keyfile used without enabling encryption Review ScanState log or LoadState log for details about command-line errors. /lae is only used with /lac Review ScanState log or LoadState log for details about command-line errors. /listfiles cannot be used with /p Review ScanState log or LoadState log for details about command-line errors. /offline requires a valid path to an XML file describing offline paths Review ScanState log or LoadState log for details about command-line errors. /offlinewindir requires a valid path to offline windows folder Review ScanState log or LoadState log for details about command-line errors. /offlinewinold requires a valid path to offline windows folder Review ScanState log or LoadState log for details about command-line errors. A command was already specified Verify that the command-line syntax is correct and that there are no duplicate commands. An option argument is missing Review ScanState log or LoadState log for details about command-line errors. An option is specified more than once and is ambiguous Review ScanState log or LoadState log for details about command-line errors. By default /auto selects all users and uses the highest log verbosity level. Switches like /all, /ui, /ue, /v are not allowed. 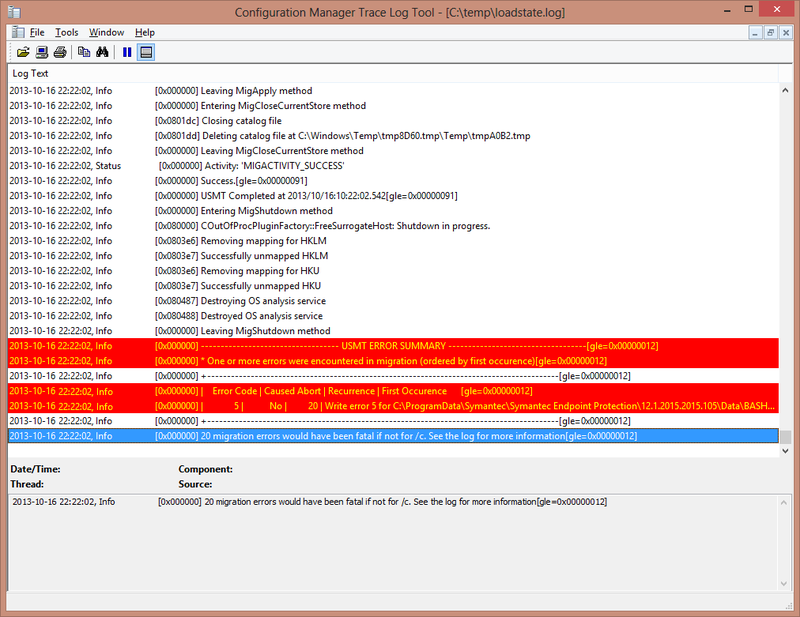 Review ScanState log or LoadState log for details about command-line errors. Command line arguments are required. Specify /? for options. Review ScanState log or LoadState log for details about command-line errors. Command line option is not valid Review ScanState log or LoadState log for details about command-line errors. EFS parameter specified is not valid for /efs Review ScanState log or LoadState log for details about command-line errors. File argument is invalid for /genconfig Review ScanState log or LoadState log for details about command-line errors. File argument is invalid for /genmigxml Review ScanState log or LoadState log for details about command-line errors. Invalid space estimate path. Check the parameters and/or file system permissions Review ScanState log or LoadState log for details about command-line errors. List file path argument is invalid for /listfiles Review ScanState log or LoadState log for details about command-line errors. Retry argument must be an integer Review ScanState log or LoadState log for details about command-line errors. Settings store argument specified is invalid Review ScanState log or LoadState log for details about command-line errors. Make sure that the store path is accessible and that the proper permission levels are set. Specified encryption algorithm is not supported Review ScanState log or LoadState log for details about command-line errors. The /efs:hardlink requires /hardlink Review ScanState log or LoadState log for details about command-line errors. The /targetWindows7 option is only available for Windows XP, Windows Vista®, and Windows 7 Review ScanState log or LoadState log for details about command-line errors. The store parameter is required but not specified Review ScanState log or LoadState log for details about command-line errors. The source-to-target domain mapping is invalid for /md Review ScanState log or LoadState log for details about command-line errors. The source-to-target user account mapping is invalid for /mu Review ScanState log or LoadState log for details about command-line errors. Use /nocompress, or provide an XML file path with /p”pathtoafile” to get a compressed store size estimate Review ScanState log or LoadState log for details about command-line errors. User exclusion argument is invalid Review ScanState log or LoadState log for details about command-line errors. Verbosity level must be specified as a sum of the desired log options: Verbose (0x01), Record Objects (0x04), Echo to debug port (0x08) Review ScanState log or LoadState log for details about command-line errors. Volume shadow copy feature is not supported with a hardlink store Review ScanState log or LoadState log for details about command-line errors. Wait delay argument must be an integer Review ScanState log or LoadState log for details about command-line errors. Specified settings store path exceeds the maximum allowed length of 256 characters Review ScanState log or LoadState log for details about command-line errors. Software malfunction or unknown exception Check all loaded .xml files for errors, common error when using /I to load the Config.xml file. Unable to find a valid Windows directory to proceed with requested offline operation; Check if offline input file is present and has valid entries Verify that the offline input file is present and that it has valid entries. USMT could not find valid offline operating system. Verify your offline directory mapping. A store path is missing or has incomplete data Make sure that the store path is accessible and that the proper permission levels are set. An error occurred during store creation Make sure that the store path is accessible and that the proper permission levels are set. Specify /o to overwrite an existing intermediate or migration store. An inappropriate device such as a floppy disk was specified for the store Make sure that the store path is accessible and that the proper permission levels are set. The file layout and/or file content is not recognized as a valid store Make sure that the store path is accessible and that the proper permission levels are set. Specify /o to overwrite an existing intermediate or migration store. The store path holds a store incompatible with the current USMT version Make sure that the store path is accessible and that the proper permission levels are set. The store save location is read-only or does not support a requested storage option Make sure that the store path is accessible and that the proper permission levels are set. Unable to find a script file specified by /i Verify the location of your script files, and ensure that the command-line options are correct. Another process is preventing migration; only one migration tool can run at a time Check the ScanState log file for migration .xml file errors. Failed to start main processing, look in log for system errors or check the installation Check the ScanState log file for migration .xml file errors. Migration failed because of an XML error; look in the log for specific details Check the ScanState log file for migration .xml file errors. Unable to automatically map the drive letters to match the online drive letter layout; Use /offline to provide a mapping table Check the ScanState log file for migration .xml file errors. The encryption key must have at least one character Check the ScanState log file for migration .xml file errors, or use online Help by typing /? on the command line. No rights to create user profiles; log in as Administrator; run with elevated privileges Log on as Administrator, and run with elevated privileges. No rights to read or delete user profiles; log in as Administrator, run with elevated privileges Log on as Administrator, and run with elevated privileges. A store path can’t be used because it contains data that could not be overwritten A migration store could not be deleted. If you are using a hardlink migration store you might have a locked file in it. You should manually delete the store, or use usmtutils /rd command to delete the store. There was an error removing the store Review ScanState log or LoadState log for details about command-line errors. Use of /offline is not supported during apply The /offline command was not used while running in the Windows Preinstallation Environment (Windows PE). Use /offline to run gather on this platform The /offline command was not used while running in Windows PE. File argument is invalid for /config Check the command line you used to load the Config.xml file. You can use online Help by typing /? on the command line. Progress log argument is invalid for /progress The Progress log could not be created. Verify that the location is valid and that you have write access. 42 USMT_ERROR_CORRUPTED_STORE The store contains one or more corrupted files Review UsmtUtils log for details about the corrupted files. For information on how to extract the files that are not corrupted, see Extract Files from a Compressed USMT Migration Store. An error occurred when attempting to initialize the diagnostic mechanisms such as the log Data transfer has begun, and there was an error during the creation of migration store or during the apply phase. Review the ScanState log or LoadState log for details. Failed to record diagnostic information Data transfer has begun, and there was an error during the creation of migration store or during the apply phase. Review the ScanState log or LoadState log for details. Unable to start. Make sure you are running USMT with elevated privileges Exit USMT and log in again with elevated privileges. An error occurred in the apply process Data transfer has begun, and there was an error during migration-store creation or during the apply phase. Review the ScanState log or LoadState log for details. An error occurred in the gather process Data transfer has begun, and there was an error during migration-store creation or during the apply phase. Review the ScanState log or LoadState log for details. Out of disk space while writing the store Data transfer has begun, and there was an error during migration-store creation or during the apply phase. Review the ScanState log or LoadState log for details. Out of temporary disk space on the local system Data transfer has begun, and there was an error during migration-store creation or during the apply phase. Review the ScanState log or LoadState log for details. 2 Responses to Where can I find the USMT return codes and error messages for USMT 5 based migrations ?